SUN Dial was an occasional journal produced by URBED with funding from the Government's Environmental Action Fund and the European community's ALTENER programme. The aim of the journal was to challenge the received wisdom at the time, which was that urban areas were inherently unsustainable. Articles were commissioned from a wide range of experts including Joe Ravetz, Michael King, Daniel Libeskind, Marcus Wilshere and Los Angeles based writer Richard Risemberg. Networking - Newsletters, the web page, and seminar programme were used to network good practice nationally and internationally. Research - A number of research contracts were developed with findings disseminated through the networking and publication programme. Promotion and support - A network of professionals provided advice to organisations promoting sustainable urban development. 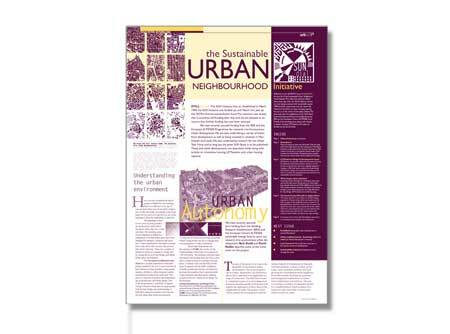 Publications - Following the publication of the Building to Last report for the Joseph Rowntree Foundation, a book on the Sustainable Urban Neighbourhood was published by Butterworth Heinemann in 1999 (republished in 2009). Exhibitions - A mobile exhibition described the principles which underlie the Sustainable Urban Neighbourhood and best practice. Development - The Initiative was involved in a number of proposals to create Sustainable Urban Neighbourhoods. This link with practitioners was crucial in ensuring that the institute remained practically grounded. Back issues of SUN dial inititive are available to download above.